Bump, open to offers but not low ballers! Hi, I purchase this kit near 18months ago but have decided not to use it. It's brand new in box as the pictures show. Cam cover has been painted but you would've needed to do it anyway so changing the colour is no big deal. Probably cost $4500 landed. Looking for $4000. Entered, hopefully I'll make it. Car Number 732. Yes, more pump under tray, probably 50% up top, 50% down below. I think from memory it is a Toyota MR2 pump. Picture won't really show but here's my setup, tank above pump is for ps fluid. I believe so yes but not 100% sure. I run an electric ps pump these days. Here's an old graph, sorry I haven't kept new ones for years.. Only change from this graph is GTR is now running Turbosmart Twin Port Actuators and a larger Exhaust Cam. Picked up about 30hp and had a slight improvement in response. RB28 built by Abe (Chris Farrow), Tuned by Phil Armour. Has all the fruit. Specs on here in previous EFR thread and over 500kw Dyno page 8. Sure is, can't see that changing anytime soon, it's a great combo for anything you want to do. It's currently having a makeover with a wide body kit and respray in Audi Nardo Grey. 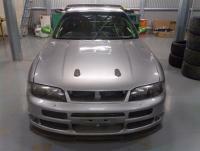 It's nearly complete, looks good, but most importantly I will now be able to run my GTR wheels/tyres (wider) under her. Yes, Brett (from Full Race) has told me several times there's no real advantage in going 9180 over my twins.I did try the larger rears (0.8) on the twins last year chasing more power but gained bugger all whilst losing easily 400-500rpm in response. You need to use an R33 or R34 power steering pump, then everything will fit. My twin 6258s made over 700hp at all four last tune. All in (28psi) at around 4700rpm. Not too shabby. Busted two of these last weekend at the Nulon Nationals. The 7670 blows!! 6boost, 1.05ts. I have since added heavier waste gate springs and picked up another 30hp and had a slight improvement in response. Next job will be to replace the cooler piping as it goes from 2.5 turbo exit to 4 back to 3 for cooler then exits as 3 straight into 4 upto inlet manifold. It's not ideal. I went from a HTA3076 to a 7670 on my RB25. Dyno graph in this thread somewhere of initial tune. Picked up power everywhere, much better car for the change. Approx 75hp gain (top end, now) since final tune with minimal loss down low.